Nearly two dozen dogs crossed the stage in Burnaby Sunday. 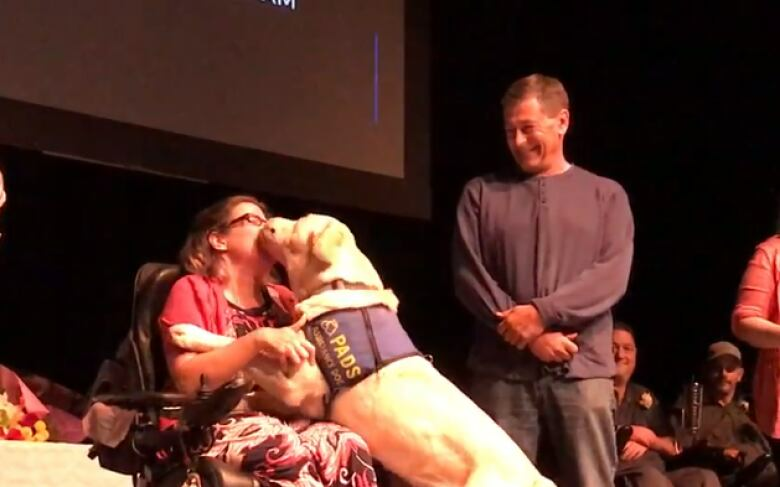 Everyone was warned when they walked into the the Pacific Assistance Dog Society (PADS) graduation ceremony this weekend: good luck keeping a dry eye. 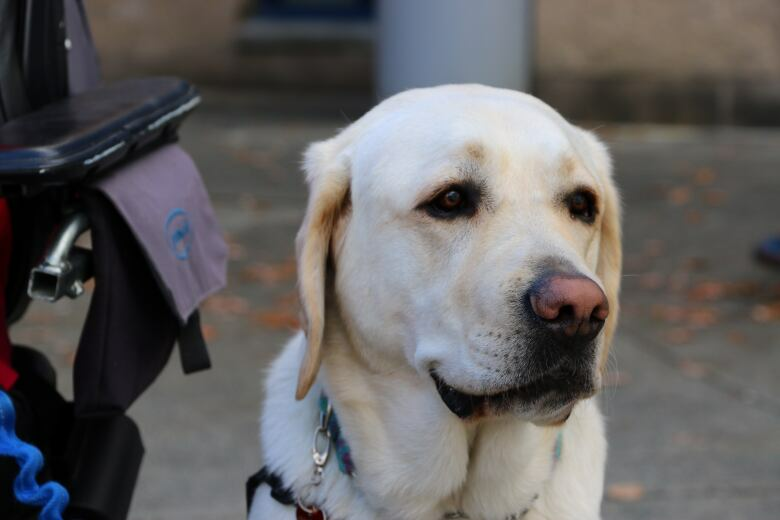 PADS breeds, raises and trains fully certified assistance dogs. On Sunday, 22 pups graduated from their training at the Michael J. Fox theatre in Burnaby — all dressed in their trademark yellow vests. The canines go on to help support workers, first responders, people who have physical disabilities and those who are hearing-impaired. As part of the ceremony, the dogs cross the stage and their leash is formally passed from "puppy raiser" — who helps train the dog — to the new partner. Rico was one of Sunday's new recruits. He went home with his new owner, Sarah Lapp, who uses a wheelchair and started working with service dogs in 2004. She also teaches dance classes, which Rico watch. "He picks things up for me, opens and closes doors, turns lights on and off, gets the phone and even pulls off my jacket," Lapp said. "It means security, it means companionship, it means everything," she added. "I don't like relying on other people, so it's important to me to have it be just me and my dog hanging out ... Rico's changed my life." Paul Lundquist was Rico's puppy raiser and formally passed his leash to Sarah onstage. 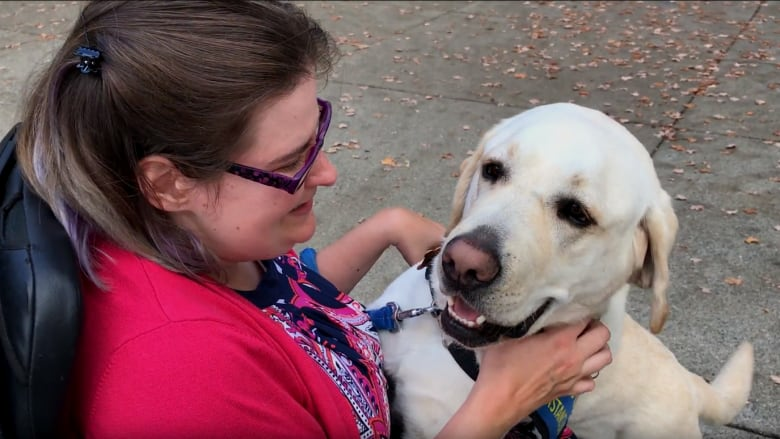 "I just feel like I'm doing something worthwhile and it makes my life a lot better," he said of training the yellow lab. "Not only with Rico being with Sarah now and changing her life, Rico changed mine," he said. "Today was so emotional. I was up most of the night all teary and all excited, but to be able to pass off my first certified service dog to Sarah was just awesome." This year also marked PADS 30th as a non-profit. Not forgotten was the society's need for a bigger centre — PADS is currently spread across five different buildings with a total of 3,000 square feet to use for all of its training programs. "We're bursting at the seams," said communications manager Tara Doherty. "It's exploding." The society is currently training 120 new puppies to be assistance dogs.